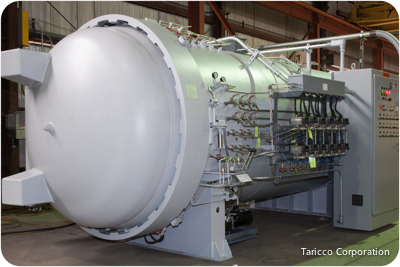 Taricco Corporation is an experienced OEM of New Autoclaves. This is a 4 ft.- 10 In. 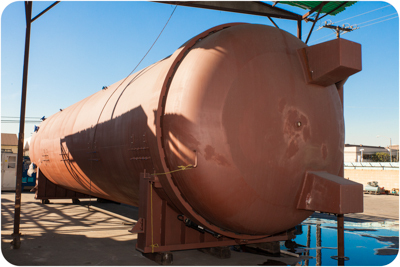 Diameter x 10 ft. length Composite/Glass Bonding Autoclave. 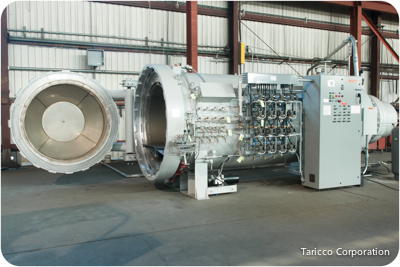 This is a new autoclave engineered and fabricated by Taricco Corporation. Designed to meet the advanced requirements of the composite bonding aerospace and racing industries, this system can used for glass laminating and armor processing. Additionally, this system is fully equipped with a full PLC TCS control system, a complete vacuum system with separate transducer lines and controllable vacuum levels. The following is a current list of available systems that can be configured to meet your specifications. 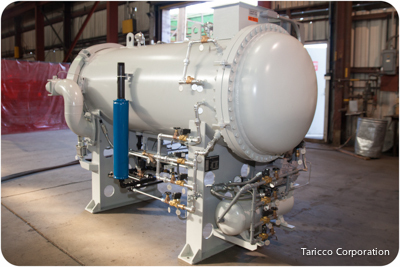 Description: This is a new autoclave engineered and fabricated by Taricco Corporation. While this system is ideal for advanced composite bonding such as Armor, Aerospace, Racing Industries, this system with its heavy duty floor system, can be used for glass laminating as well. Additionally, this system will be shipped complete with TCS Controls, motor control center, and vacuum system. 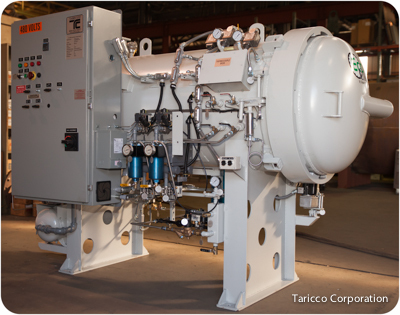 Description: This is a new autoclave engineered and fabricated by Taricco Corporation. Designed to meet the advanced requirements of the composite bonding aerospace and racing industries, this system can used for glass laminating and armor processing. Additionally, this system is fully equipped with a full PLC TCS control system, a complete vacuum system with separate transducer lines and controllable vacuum levels. 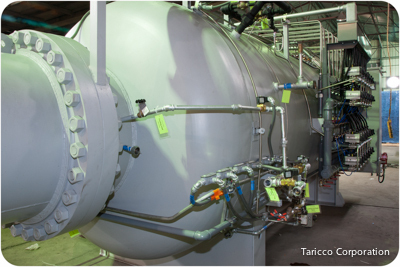 Description: High Performance Energy Efficient Autoclaves by Taricco Corporation. 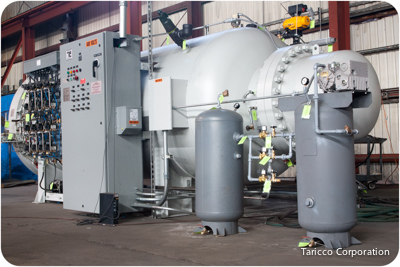 Taricco Corporation Engineers have utilized some of the most advanced technology in mechanical design to bring you the EcoClave autoclave system. This EcoClave autoclave system comes loaded with an onboard part vacuum system with part transducers and pump, the TCS Thermal Control System, and much more. 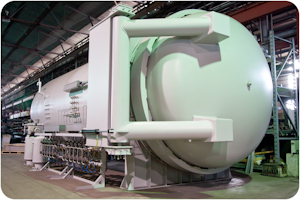 The EcoClave is a high performance energy efficient and environmentally friendly autoclave system. The EcoClave is designed and engineered to meet today's composites, circuit board, and glass bonding industry performance standards. These environmentally friendly systems do not use hydraulics and only a few moving parts require oils. This proven design ensures a low risk to the environment and years of smooth operations.